Posted on 01/14/2012 by Amanda W.
You’re estatic –– you’ve landed your first paying dance gig on a cruise ship. Not only do you get paid to do what you love in your contract, you receive a free room, meals, and get to see the world. That all changes when your Costa Cruises ship hits a sandbar Friday evening near the island of Giglio, tipping the ship. 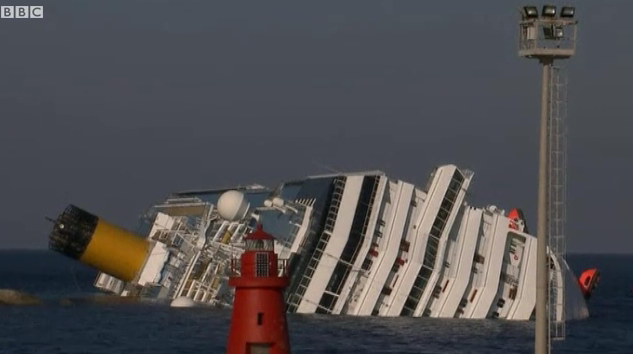 Three passengers are reported dead, according to BBC Europe, and divers are still searching for an additional 40 people. One of the British dancer’s mothers told BBC that her daughter had to attach a rope ladder to a boat or raft to get a shore. She told her mother she was “lucky to be alive.” Listen to the BBC interview. Many of my dancer friends have worked for Royal Caribbean, Carnival and Holland America cruise lines. I can’t help but think: what if one of them were one of the eight dancers on the ship? My heart goes out to the ship’s dancers –– and all the passengers and their families in this tragic event. Amanda Whitesell has more than 20 years of training in the performing arts and entertainment industries. She is the Web Editor and a Staff Reporter for the Livingston Daily Press & Argus. Email her at awhitesell@gannett.com. Posted on 09/27/2011 by Amanda W.
I won’t be the only Oklahoma dancer spending my winter holidays in the mitten. Sofia Menteguiaga, Tulsa Ballet soloist, and Alfonso Martin, Tulsa Ballet principal, will appear as guest artists Dec. 3 and 4 the Fountain Dance Ministry‘s production of the Nutcracker. The ballet will be performed at Jane Tasch Performing Arts Theatre, 2100 E. M-36, in Pinckney. As a young dancer, I remember going to the company’s annual production when Fountain Dance Ministry was known as Brighton City Ballet. While sickled feet and bent knees were masked with smiles – as expected from youngsters – the professional dancers hired to perform the Caviler and Sugar Plum Fairy roles filled a void. And, there’s something about any rendition of the two-act ballet that makes a young girl’s inner sugar plum fairy come to life. Brighton City Ballet’s Nutcracker has been performed for 25 years, said Deborah Shiposh, co-director of the company. The company joined with Debbie Tweedie in 2007 to form Fountain Dance Ministry, and guest artists have performed with in the production for more than 20 years. The company hires dancers each year through an agent, Shiposh said. Past guests have included dancers from Boston Ballet and Milwaukee Ballet. It’s been a while since I’ve seen the company’s production, but I plan to attend this year. I hope to not only be enchanted by the sounds of Pyotr Ilyich Tchaikovsky’s score, but the professional “umph” Menteguiaga and Martin are bound to bring. Tickets are $20 for adults and $17 for children teens and senior citizens. They go on sale at the end of October.